According to the belief of the ancients, to own a sapphire was to render unnecessary the ministrations of the priest and the physician, for it was thought that this stone made its owner good-natured, filled his soul with religious zeal, protected him from the poison of venemous insects and reptiles, preserved the eyesight, cured the gout and ague, and kept off the plague. There is a legend that the commandments were engraved on sapphires. Edward the Confessor  had a sapphire which was brought to him from Jerusalem. This jewel, which was set in a ring, had an occult power which enabled him who wore it to bless other rings, which were called cramp rings. The stone is now among the crown jewels of England . 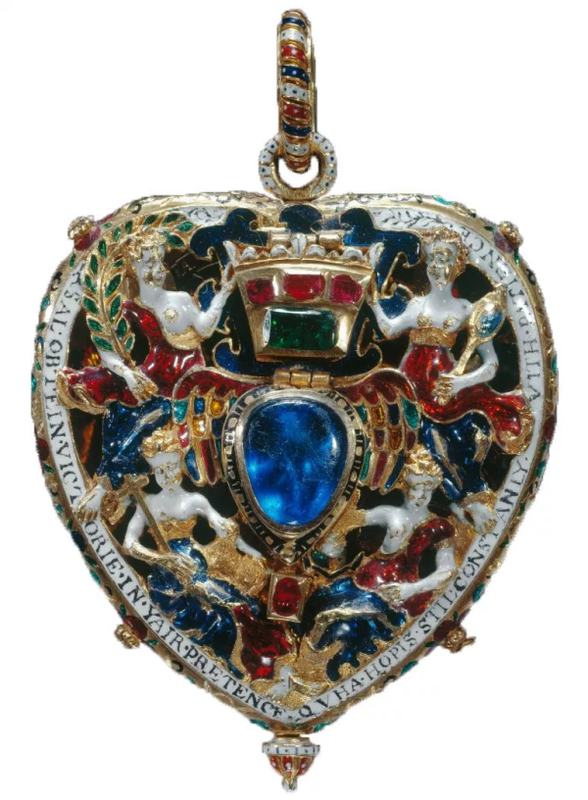 The article may be referencing the Lennox Jewel, which now resides in the Royal Collection. The center element is not a sapphire; it's made of cobalt blue glass. 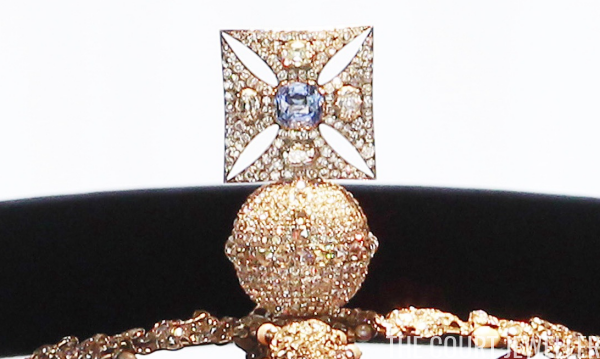 One of the most celebrated sapphires was formerly owned by the Countess of Lennox . This poor lady, who was the mother of Lord Darnley , seemed to be doomed to be unhappy. Coming into the world where she was not wanted, at a time when she was most unwelcome, and buffeted about by ill fortune, she led a life of almost continued martyrdom. About the only cheerful incident connected with her career is the record of an order given by her uncle, King Henry VIII , for "6l 3s 4d, a gift to the Lady Margaret to disport herself this Christmas," the money being given to be used at cards and at other games at which betting was customary. The Countess of Cork and Orrery  owns a diamond star in the center of which is set a sapphire with an interesting history. When Queen Elizabeth  lay dying, she was asked to name her successor. "I will have to succeed me," she said, "no rascal's son, but a king's," stating that she meant the King of Scotland . The lords and ladies surrounding her bed asked her a few hours later whether she was of the same mind. Although that voice so long accustomed to command was now silenced forever, the lion queen, with all her remaining strength, lifted her arms and clasped her hands over her brow in the form of a crown. The question now was what lucky individual should be the first to inform the Scottish king of his succession to the throne of England. On the dead hand of Elizabeth there gleamed the blue light of a sapphire. Hastily slipping off the ring, Lady Scrope  carried it to the window under which her brother, Robert Carey , stood awaiting news of the queen's death. Having caught the ring, which was thrown to him by his sister, Cary mounted his horse and rode to Scotland, where he gave the jewel to the new sovereign as a token that its bearer had been the first to bring the welcome tidings. 1. Edward the Confessor (1003-1066) was one of the last Anglo-Saxon kings of England, ruling from 1042 until his death in 1066. A few months after his death, England was conquered by the Normans. He was canonized in 1161. 2. St. Edward's Sapphire is a rose-cut gemstone that is said to have belonged to Edward the Confessor. It's thought that the sapphire was set in Edward's coronation ring, and that it was buried with him when he died in 1066. The sapphire was allegedly removed from the late king's body when he was reinterred at Westminster Abbey almost a century after his death. After that, its history gets seriously murky, but by the nineteenth century, it was set in the Imperial State Crown on the order of Queen Victoria. That's where it lives today, set in the cross atop the crown's monde. 4. Henry Stuart, Lord Darnley (1545-1567) was the elder son of Lady Margaret Douglas and the 4th Earl of Lennox. He was the second husband (and first cousin) of Mary, Queen of Scots and the father of King James VI and I. Darnley was murdered in Edinburgh less than a year after his son's birth. 5. King Henry VIII of England (1491-1547) was the elder brother of Margaret Tudor and, therefore, an uncle of Lady Margaret Douglas. He famously gave Lady Margaret that generous monetary Christmas gift at Greenwich Palace for three years in a row: 1530, 1531, and 1532, the years preceding Henry's marriage to Anne Boleyn. 6. Emily Boyle, Countess of Cork and Orrery (1828-1912), born Lady Emily de Burgh. She was the second daughter of the 1st Marquess of Clanricarde. Her husband, the 9th Earl of Cork, served as both Master of the Horse and Master of the Buckhounds during Queen Victoria's reign. This is the same Countess of Cork who was a leader of the committee that gave Queen Alexandra her famous kokoshnik tiara. 7. 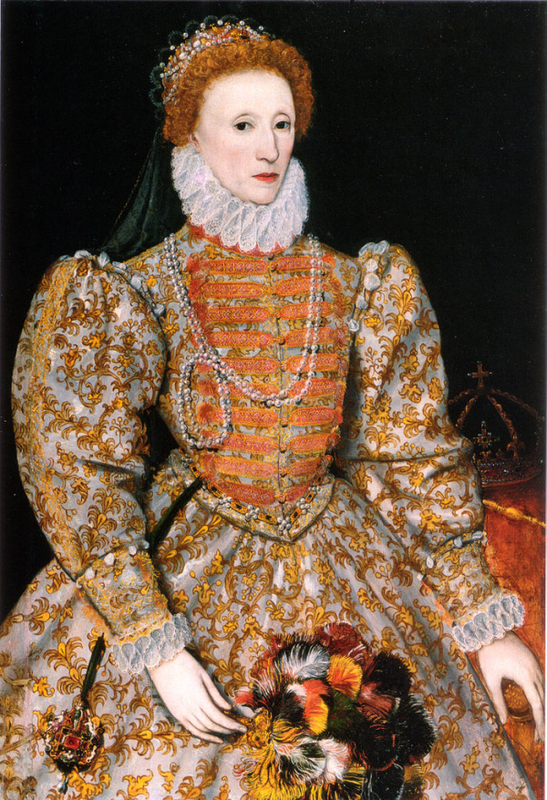 Queen Elizabeth I of England (1533-1603) reigned from 1558 until her death in 1603. Contrary to what's stated here, Elizabeth staunchly refused to name a successor, and after her death, it was the privy council, led by Robert Cecil, 1st Earl of Salisbury, that ultimately proclaimed Elizabeth's cousin, King James VI of Scotland, as King James I of England. 8. King James VI and I (1566-1625) became King of Scotland as an infant in 1567 after the abdication of his mother, Mary, Queen of Scots. In 1603, he succeeded his cousin, Queen Elizabeth I of England, becoming King James I of England. He reigned over the three kingdoms of England, Scotland, and Ireland until his death in 1625. 9. Philadelphia Scrope, Lady Scrope of Bolton (1550s-1627) was born Philadelphia Carey. She was a granddaughter of Mary Boleyn, Anne Boleyn's sister, and therefore was a cousin of Queen Elizabeth I. (Or, depending on which historical novelists you read, a secret niece of Elizabeth, as Mary Boleyn was one of Henry VIII's mistresses.) Philadelphia was one of Elizabeth's ladies-in-waiting at the time of her death. 10. Robert Carey, 1st Earl of Monmouth (1560s-1639) was a brother of Philadelphia Carey Scrope and, therefore, another cousin of Queen Elizabeth I. He really was at Elizabeth's deathbed, and he really did ride straight to Scotland to break the news of her death to King James. He wrote a memoir that describes the trip, which took several days and ended up putting him in the doghouse conduct-wise.